The purpose of the Johnny and Sarah Frank Scholarship Fund is to provide financial support to Alaska residents of Athabaskan Indian heritage attending the University of Alaska. First preference for awards is given to students who are from Arctic Village or Venetie. Strong consideration is also given to students of Athabaskan descent from Fort Yukon, Chalkyitsik, Birch Creek, Circle, Beaver, Eagle, and Fairbanks. Please make your check payable to the University of Alaska Foundation, and mark it for the Johnny and Sarah Frank Fund. 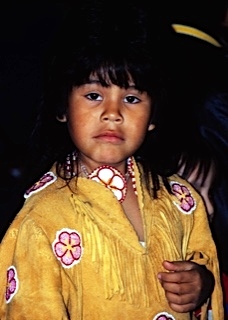 The Athabascan Gwich’in, the northernmost Indians in North America, live in remote villages scattered across the vast interior Arctic from northeast Alaska to northwest Canada. The Gwich’in Steering Committee was formed in 1988 in response to proposals to drill for oil in the coastal plain calving grounds. The Steering Committee is working to have this area of the Arctic National Wildlife Refuge permanently protected. “We are caribou people. Caribou are not just what we eat; they are who we are. They are in our stories and songs and the whole way we see the world. Caribou are our life. Without caribou we wouldn’t exist."